This past week a team from Illinois was in Haiti. We had a team of guys wiring some of the camp dorm room for electricity, a veterinarian, a dental team and nurse. The 2 Haitian doctors that I usually work with, Dr Gregory and Dr Rony, worked with us also. I never made it out of the mobile clinics in 4 days to see the vet working or the construction team. The clinic was so busy! I worked in the pharmacy, gave out numbers to people coming to be seen and ran around trying to find needed supplies. I think we all worked really well together, especially considering the amount of work we did. We saw some burns, from people always cooking over open fire. We saw a lot of older people with high blood pressure. And there were plenty of skin infections to go around. The biggest problem was scabies. We gave out treatment and taught the families how to rid their household of scabies. I have been trying to stress the importance of good hygiene to the people in the village of Peredo. But hygiene isn’t as easy in their life as it is in mine. I can take a shower, launder clothes in a washing machine and do all this with clean water. Out in the villages, the women in the families have to carry water back to the house. Some people take a public bath in the river, the same river that animals are standing in and people are washing their clothes in and taking back to the house. So telling a family to wash their clothes, bedding and all the fabric in the house in boiling water is not an easy task. Also the treatment available involves “painting” the skin with an anti-scabies medication twice a day for 3 days and then repeat in 7 days. They have large number of people living in one household so this makes the task very time consuming. The time that the parent spends on this clean up is time that they are not working. They have to work to survive. So for example, the time mom is spending on scabies treatment is time she is not in the market making money or not walking to get water or not cooking for the family. Compliance is a difficult issue. When the clinic is built in Peredo these types of issues can be addressed more thoroughly. The clinic workers can do follow-up and make sure the prescribed treatment is being followed. We can also have health education classes on these common healthcare issues. One thing I learned recently about the Creole language is the way they do not take blame for actions. For example, say I had a glass of water and I dropped it. In English we say, “I dropped the glass.” In Creole we say, “The glass fell.” One real life example of this is last Friday the team that was here in Haiti, Pastor Gerard and I were going to a famous waterfall in southern Haiti called Basin Blu (Blue Basin). (see http://www.haitiantips.com/haiti-video.php/1103 for a video of this natural waterfall). We were driving down a steep road/alleyway and a big dump truck full of rocks was coming up the hill. It was a close call whether the trucks were going to hit each other as they passed b/c they were so close. The Trucks did not hit but the side view mirror on the big truck nearly knocked the American Veterinarian, Dr Mike, out of the truck. As those of us sitting in the back of the truck scrambled to grab onto his legs and feet (which were the only body parts still in the truck) the dump truck started sliding backwards and when the rocks in the back shifted, the truck fell over. Pastor Gerard was driving and saw what was happening from his rear-view mirror and got out truck out of the way just in time. God was truly with us that day, I know he is with us every day but He showed it last Friday. It was such a close call. The Haitian driver of the dump truck was uninjured too. After this happened there was a crowd of people all around saying, “The truck fell.” I had to laugh. At that point there was no blame being placed. (From my view from the back of the truck, I don’t think it was anyone’s fault this time. Just an accident) Would have been a different story in the US. It got a little chaotic as Haitians were crowding around our truck. I didn’t speak to any of them in Creole as I didn’t want to say the wrong thing. I only begin speaking in Creole to the police when they showed up. We went to the police station in Jacmel, what an adventure for the team of Americans! 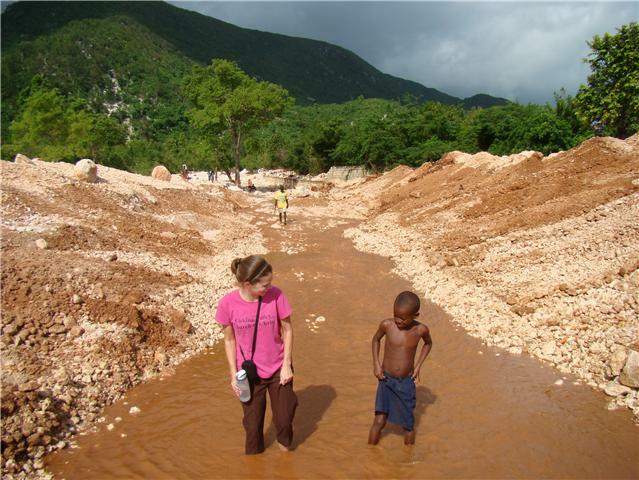 The vast majority of Haitians do not have a vehicle. One form public transportation in Haiti is “taxis”, which are motorcycles. They usually put 2-3 people on a regular size motorcycle. I have seen up to 5 on one! The other form is what they call a “tap-tap.” A tap-tap is a small truck with benches built into the bed of the truck and some kind of covering over the bed of the truck. Sometimes the covering is a tarp, sometimes a sheet of metal or plastic and sometimes a truck topper jacked up high enough to be able to sit under. They pack people into these vehicles and put goods and belongings on top of the truck. Sometimes people even have their chickens and goats on the tap-tap too. There are thousands of these trucks in the city of Port-au-Prince. They get the name tap-tap because when someone is ready to get off they tap the side of the truck and the driver stops.